Friends strive to heed the promptings of an “Inner Guide,” whose leadings enable us to serve the spirit while carrying us forward in our own spiritual growth. But another voice from within – that of the “inner critic” – may confuse and disrupt our discernment or may make us feel too small and unworthy to wholeheartedly follow the Guide. 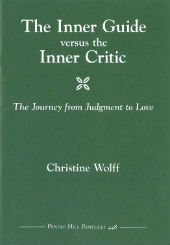 Christine Wolff, informed by her studies of psychology and spirituality and her practice of psychotherapy, offers insights into the difference between these two inner voices with suggestions about how readers may overcome limitations that come from a too-active inner critic. Personal examples, exercises, and a study guide are included. Christine Wolff is a member of Framingham Friends Meeting in Framingham, Massachusetts. She has been involved with Friends for about forty years, beginning with an American Friends Service Committee work project in her early twenties. She has been a practicing psychologist about the same length of time. She is a student of the Diamond Approach, a path that incorporates psychology and spirituality as parts of a unified whole. Along the way she has studied Buddhist meditation, transpersonal psychology, and many other schools of psychological thought.